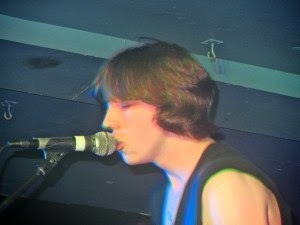 Catfish And The Bottlemen are the latest indie buzz-band, championed by XFM and Radio 1 and getting serious airplay on both. 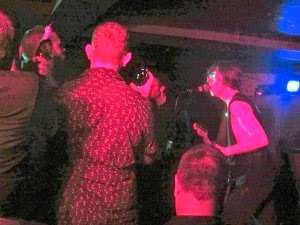 They're out on what seems like a never-ending tour of smaller venues to grow their already sizeable following. We caught up with them at Manchester's FAC251 to see if all the hype is justified. This Feeling has a reputation for picking out great line-ups of bands and putting them together for a great night out. Whilst Catfish are the headliners this evening, the place is already full for the two local bands that precede them. Opening up are the excellent The Slow Readers Club. Founded out of the ashes of Omerta, who at one point seem destined for the plaudits being thrown at Catfish now, they released their wonderful self-titled debut album at the end of December 2011 and are coming back with a new single Forever In Your Debt in October and tonight is their first Manchester gig of the year. Tonight's set is a mix of songs from that debut album, including those mesmerising early singles One More Minute and Block Out The Sun that should have catapulted them to fame and fortune first time round, and a batch of new songs which augur well for their future. Forever In Your Debt is just aching to be picked up by radio. There are inevitable comparisons with Joy Division and Editors, as if that's a bad thing in its own right, but in singer Aaron they have a front man with the personality and presence to avoid them being tagged as copyists. Next up are the much less experienced Puppet Rebellion who can probably count the number of gigs they've done so far on a pair of hands. Despite that, they've built up a sizeable following in Manchester already and their crowd is no smaller than that for the headliners. They open with two songs from their brilliant debut EP, the title track Chemical Friends and New Twenty and close with the third track The Greatest Lie Ever Told, but in between we get an insight of what to come with four other new songs, all of which scream potential single, particularly penultimate song Green Eyed Monster, a tirade against a jealous ex-girlfriend. Their on-stage chemistry is interesting to observe. The two guitarist, bass and drums approach creates a serious and thrilling sonic wall without them visually acknowledging each other's presence during the songs. This leaves the spotlight free for singer Simon who prowls the front of the stage and demands the crowd's attention and he gets it. He makes you feel the songs as if you wrote them yourself and they're being sung about you. Already, there's a feeling that they could be huge given the right breaks and they've won over a new set of fans tonight. It's quite a tough act for the headliners to follow, but Catfish are becoming masters at this already. You have to suspect that with the backing of Communion Records who are licensed to one of the majors, the size of small venue tour they're doing and the fact that they have two crew already that there's some serious players behind them with a plan to make them huge. This wouldn't be a bad thing. 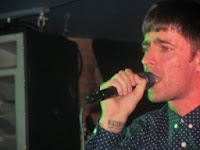 The great thing about them, from their interaction with the crowd, their enthusiastic presence on twitter and their no holds barred balls out full on approach to their music, is that they feel completely natural and at ease. There's the old heads down rock-out approach favoured by bands for decades since musicians discovered the ability to crank amps up to the max, a guitarist who could be the coolest man on the planet, oblivious to the antics of his front man and the Manchester crowd piling on to the raised area at the front of the stage during pretty much every song of the set. New single Rango, out in a few weeks, has already had significant airplay and is going to take them up another level. Their real test will be to extend their thirty minute or so set, which feels like a non-stop roller coaster ride of frenetic energy, into something that can hold the attention with a little more variety. For now though, they look and sound unstoppable. 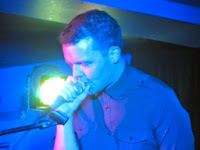 The Slow Readers Club website can be found here. They are also on Facebook, Twitter and Soundcloud. Catfish and the Bottlemen's website can be found here. They are also on Facebook and Twitter and are on an extensive UK tour through September and October.